In 2003, the huge Paradiski area was created, linking the ski resorts of Les Arcs, Peisey-Vallandry and La Plagne and giving guests staying here access to over four hundred kilometres of pistes! Les Arcs is made up of several areas; each situated at different altitude and each with its own individual character and atmosphere. One epic run is ten kilometres long and descends over two thousand meters. Les Arcs is considered the home of European snowboarding. It’s here that snowboarding legend Regis Rolland made the seminal and surreal ‘Apocalypse Snow’ films. La Plagne is also made up of different interconnected yet individual areas. There’s the quiet and traditional Plagne 1800 and the more boisterous Belle Plagne who enjoy their nightlife. Peisey-Vallandry is probably the best located out of the three resorts, for making the most of the Paradiski area, and is a little more homely than the other resorts, but is well suited to all abilities. 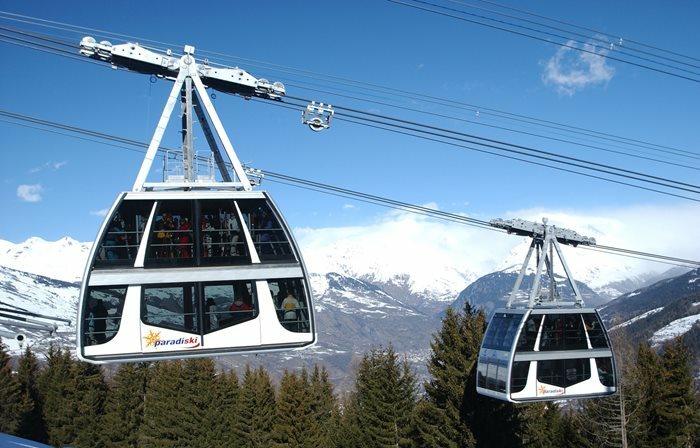 Ski-Lifts offer airport transfers to all the resorts in the Paradiski, in both the summer and winter. There are various options for your transfer to the Paradiski with many airports and train stations being accessible. Transfers from Chambery airport, Lyon airport, and Geneva airport, take 2 to 3 hours, depending on traffic and weather conditions. Transfers from the train station in Bourg St Maurice are much shorter. Ski-Lifts also offer a range of transfer types to Paradiski at great prices. Including private transfers, executive transfers, luxury limousine transfers, stretch hummer limousine transfers andcoach transfers. So whatever the size and budget of your party, we’ll have an airport transfer option for you. Simply use the quote generator, choose your preferred airport transfer to resorts in Paradiski and make your booking online.